Job Board is UP! | Earn Dollars Pinoy! Okay, some disclaimer here. Just so you know, scam is all over the internet. Posting the jobs on the board doesn’t mean that I know the advertisers/employers. I haven’t tried to apply for one (not yet as of this writing). Neither am I saying that the jobs on the board are scams. I want you to be clear on that. If you have been doing freelance work, you know what I mean. If this your first time to apply for online jobs, then make sure that you know what you’re getting into before you apply for a project. If you like what you see on the Job Board or hoping to find that project you are so good in doing, then please don’t forget to subscribe to this blog. 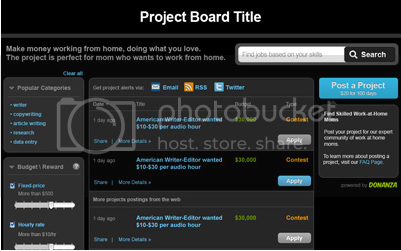 Updates on the job board will be emailed as soon as there are new projects available. If you don’t then that dream project might go to another freelancer. If you get hired, do comment on this blog, so I’ll know that I was able to help one lucky soul! Enjoy the hunt and Good luck! ms. eidhra, thanks for posting this. i might try searching for a legit job here… visiting you by the way via The Bloggers Exchange. my other blog dropped by too. hi sis, my contest is up. hope you can join too.